I love being able to apply math and science concepts to real life! 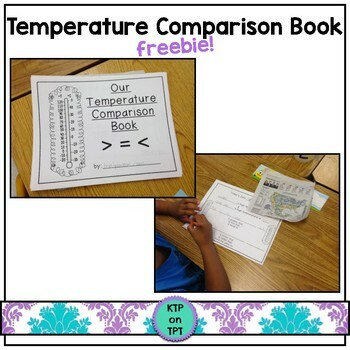 I created the pages for this class book when we were learning about comparing two numbers. I wanted my students to have a hands on experience with comparing numbers, to help them really understand why this skill is important. I cut out weather reports from the newspaper and gave each pair of students a report. They got two pick two cities and compare the temperature between those two cities. We had a lot of fun with this activity!! Please visit my blog to read my post with more details and pictures! Click HERE! to read my post with more details and pictures! • Please go to your My Purchases page (you may need to login). Beside each purchase you'll see a Provide Feedback button. Simply click it and you will be taken to a page where you can give a quick rating and leave a short comment for the product. I value your feedback greatly and honest feedback helps me create better products. If you have a download or printing issue, please email me at KTPonTPT@gmail.com BEFORE leaving feedback. I am more than happy to do everything I can to solve those problems or fix any issues for you! • Look for the red star near the top of any page within my store and click it to become a follower. You will now receive customized email updates about this store. I love making new friends! !